produced by Crazy Mind’s was recently released on YouTube. 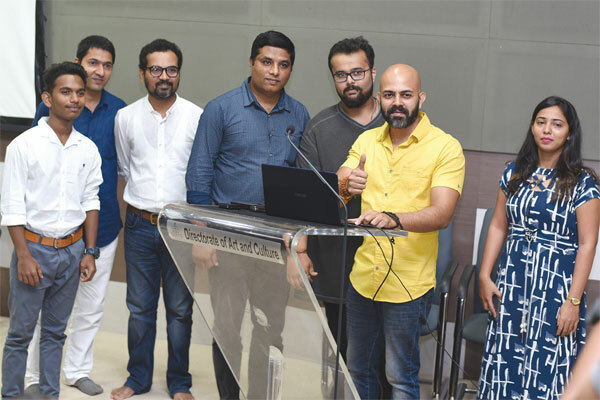 Producer Anay Kamat, singer Rajesh Madgaonkar, composer Dilip Waze and Sindhuraj Kamat, lyricist Sanjay Borkar, choreographer Chinmay Borkar, and all the artistes of this video song were present for the release of the video at Department of Arts and Culture, Panjim. On the occasion, Chinmay Borkar performed a solo dance, while Saidatta Kamat presented a mimicry act. This devotional song is dedicated to Lord Ganesha. This is the first music dance track on Lord Ganapati in Konkani language. “This song is not a traditional ‘aarti’; it is a special song made in Goa for Ganesh Chaturthi. We have done this video with the involvement of various artistes and are sure that people will definitely like it,” said Anay Kamat. About 70 artistes have contributed to this video song. It includes dance artistes, actors and others. The end product is a unique gift in time for Chaturthi. The team of this production has appealed to people and Sarvajanik Ganeshotsav Mandals to play this song on the occasion and spread devotion.